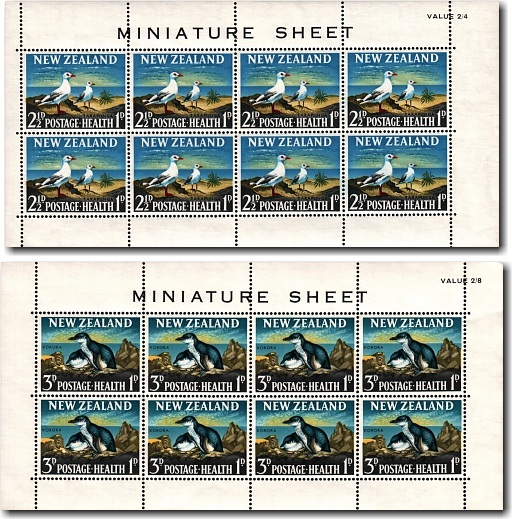 The 1964 health stamps feature the Red-billed Gull (Tarapunga or Akiaki) on the 2½d stamp - a native of New Zealand, being found throughout the country and also on outlying islands including the Chatham Islands. The 3d stamp features the Little Penguin (Korora) - the smallest species of penguin measuring around 43 cm tall. In New Zealand they are also known as Little Blue or just Blue Penguins due to their slate-blue plumage. Two miniature sheets were issued including eight stamps for each denomination. 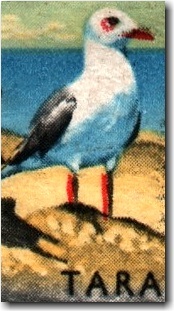 A notable flaw on the 2½d stamp exists where the registration of the red printing is offset resulting in a red billed gull with four legs.